As I mentioned in my previous post, I have just returned to Buffalo from the Prague Quadrennial. Aside from my Six Acts performance, there was also the International Exhibition of Scenography which I attended once my performance was complete. The exhibition consists of two sections, the student section, and the professional section. Each section then has multiple exhibits classified by country. The exhibiton resided on the entire main floor of Pragues Veletrizni Palac – an art museum in Prague, as well as portions of 3 other floors. To be honest, I found it extremely overwhelming. There was so much to see and do all at once, and I was bombarded with so much visual imagery it made my head spin. I began to take pictures of literally everything I found interesting so that I could look at them later to actually digest all the information. I had to go through the exhibition in 2 hour chunks. If I was there for more than 2 hours I began to enter a daze in which I could no longer process any of the visual information in front of me. On the first day I went straight to the student exhibits, since I had a participation activity planned for me at the USA Student exhibit. At the USA exhibit I was paired up with a girl named Megan from Carnegie Mellon. Megan and I were given a short poem by Langston Hughes, and were told to create. We ended up making a “dream book” an object mentioned in the poem that captured our attention. This collaborative process was also enjoyable. This time there was text and given circumstances to take into account. After that I was able to go through about 15 more student exhibits before I reached my max for the day. The next day I was able to finish going through the rest of the student exhibits on another floor, as well as begin going through all the professional exhibits. The entire exhibition floor varied from one extreme to another. There were no set guidelines for a country to present and I don’t think I would have wanted it any other way. However this great discrepancy in presentation styles definitely through my nearly-fried brain through a loop. Aside from sharing all my pictures with you I really can’t go through every single exhibit and describe what each country is doing in the realm of scenography and what that means to me. To be honest I’m not even sure yet. It’s been over a week since I was in the exhibition floor and I’m still trying to comb out my thoughts. What I can tell you is what I noticed, and that is the fact that visual art and theatre are one in the same. Theatre just has an added element of motion, which makes all the difference. Many exhibitions were installations, or interactive spaces that allowed the viewer to explore and create. Some were pictures, some had model boxes, many were a collage of a plethora of artifacts and designs, very few had live performances, many had electronic display boards that moved to a new image every 3 to 5 seconds, and most were trying to express what scenography meant to them. When trying to digest all this content, you begin to realize how important the presentation of the content truly is. I would come to exhibits and be somewhat jaded by the presentation format, and thus be less inclined to stay at the exhibit to view the content – no matter how marvelous or magical it may be. I realized this early on, probably after the first 5 exhibits I went into. Presentation was everything. A good presentation would make mediocre designs look amazing, and the opposite was true as well. I found it shocking how few really incorporated live performance into their display. While it is understandable that one cannot afford to bring entire acting troupes from one’s home country to display a taste of “national theatre” it is still surprising since everything became a piece of visual art rather than a piece of moving narrative, or theatre. 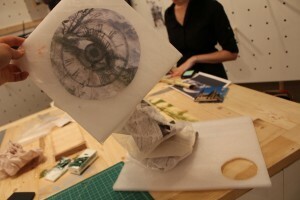 I would go into exhibits and treat it as an installation with a collage of visual art inside. Even the few bursts of live performance that was on display at the exhibition could be considered performance art. Some countries seemed to be exhibiting art rather than theatre – as there were only posed photographs on display – sometimes not even involved in theatre. Don’t get me wrong. I thoroughly enjoyed the exhibition floor, I don’t really care if theatre is presented as visual art or not, to be honest I don’t think there should be such a distinct mental divide between the two. I think they are the same. The only difference being the way they’re presented.